Choosing a Data Recovery company – BEWARE! Data Recovery in Ireland – The importance of a having a well-maintained Cleanroom with expert staff. We received this Hitachi hard drive from a customer last week which had previously been with another company offering “Professional Data Recovery” services. This drive had suffered a liquid spill and the customer was told that the drive was “badly corroded” and that it would require “Advanced Recovery” with a hefty price-tag. We provided a second-opinion for the customer and immediately informed them that the drive had been opened prior to arrival with us. We took the attached photo and showed the customer that the drive had not been opened in an appropriate environment and clearly without any cleanroom gloves. 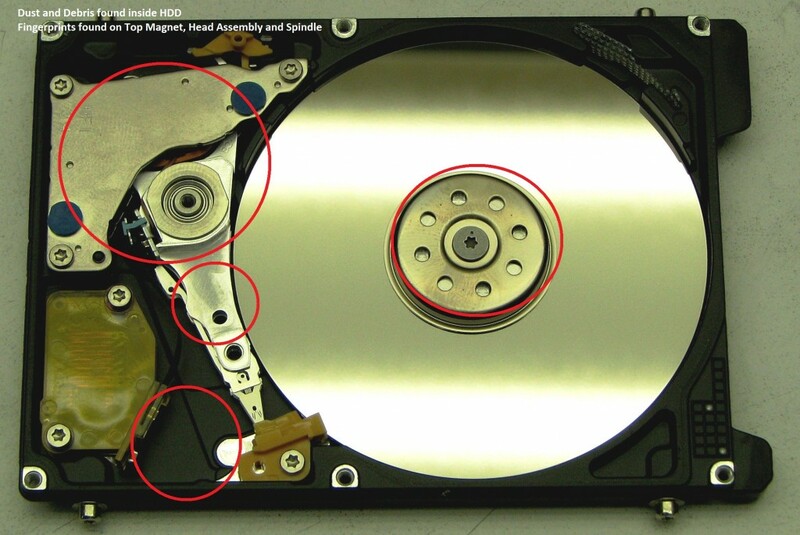 The drive had very visible fingerprints on the Top Magnet, Head Assembly and the spindle screws. The customer was shocked to see such amateur work and was very unhappy with the previous provider. The Circuit Board had suffered liquid damage and repair had been unsuccessfully attempted. We de-contaminated the drive components in our Class-100 Cleanroom Lab and successfully repaired the electronic circuit board. Within 24 hours, we successfully created a sector-level clone of the drive and extracted 100% of the user data. Most users are fortunate enough not to have to require data recovery services. However, for those who do, this case illustrates the importance of choosing a reputable data recovery company who operate on-site cleanroom facilities. 1) What exact work is required to recover my drive? You are the customer and you have a right to know. 2) Do you have a Class-100 Cleanroom for such work? Always ask to see the cleanroom. If they can’t show you – then it likely does not exist! 3) If you are told that your drive requires “Advanced Recovery” Why can’t you do it? Will my drive be sent to another provider? Is this provider outside our jurisdiction? There are obvious data protection implications here. 4) Can I speak to the engineer who is working on my drive? If you have questions, the engineer working on your drive is the best person to speak to. If they are unavailable, ask them to call you back. CDS have invested heavily in a state-of-the-art Class 100 Cleanroom in Dublin. We are always happy for our customers to visit and we assure you of absolute attention from the engineer who is recovering YOUR data. He will always be happy to speak with you and answer any questions that you have about YOUR drive. You can take a Google Street View tour of our lab here Better still, why not visit us!